October 2018 – #DoubleFML FatDarrellPalooza! Well, it’s been a full week now. I think the clam flavored candy cane burps are finally almost gone…almost. Ever since I posted that taste test last week, people have been making all kinds of crazy suggestions for what I should try next. Ha! Let me just nip that in the bud already! As… Continue reading Emergen(PE&C)y 911! Doomsday 2018: A Phenomnomnomenal Ending. I’ve been told that I wear black way too often but today seemed appropriate. You see, this may very well be the last day of my life. That’s right, you read that correctly. The doomsday package I referred to last post has arrived early so, today is the day that I’ll be trying those disgusting… Continue reading Doomsday 2018: A Phenomnomnomenal Ending. Ha, look at me pretending to be an actual adult in the cover photos! Before you give me too much credit though, here’s what I’m currently wearing… Actually, compared to the rest of my crazy tees, this one is tame. Besides, RUN DMC are legends! 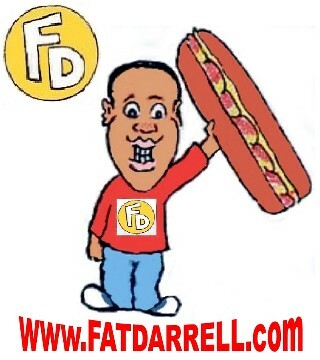 Anyway, welcome back to #DoubleFML FatDarrellPalooza! So, if you’re keeping… Continue reading Party Time! Excellent!